A new palette! 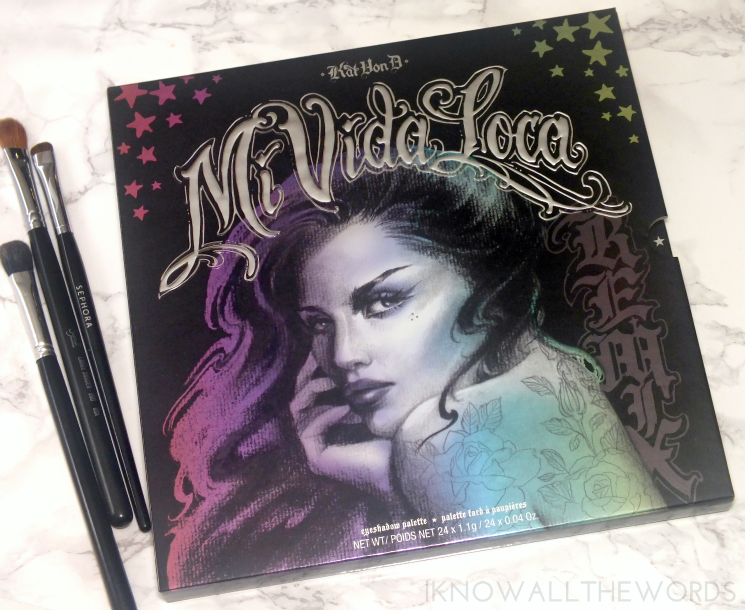 It feels like it's been a while since I've dipped into a new shadow palette... That might not be the case, but I was very excited to dive into the colourful wonder that is the limited edition Kat Von D Mi Vida Loca Remix Eyeshadow Palette. It's a very pretty sight. 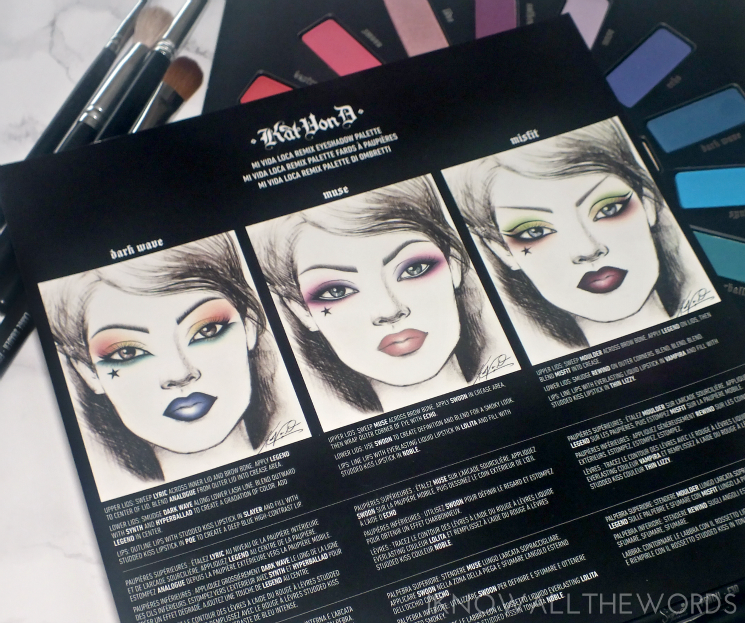 Read on for a closer look and to see my re-creation of one of the looks Kat created. While the packaging does have some flaws, the shadow layout is kind of perfect. The neutral shades take residence in the centre wheel with the spectrum of colours making up the larger, outer wheel. I love that the shadows resemble a colour wheel, as it makes it easier to take in all the shades and mix and match. 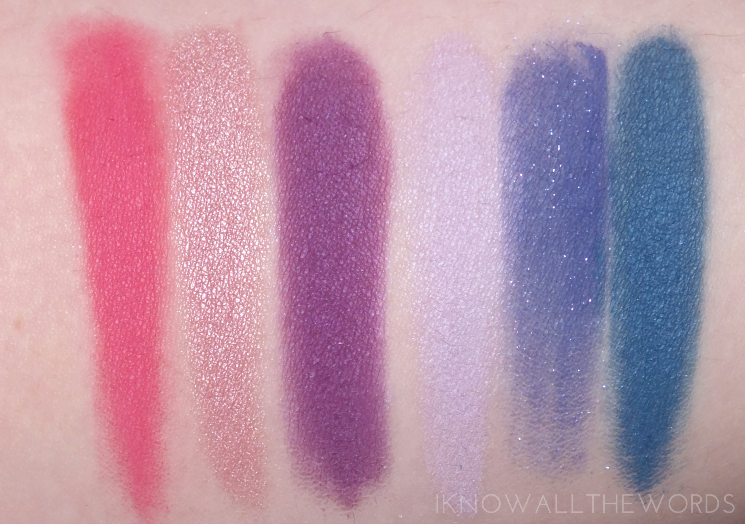 The shadows have a variety of textures- stains, mattes, shimmers, and one glitter- with most performing quite well. 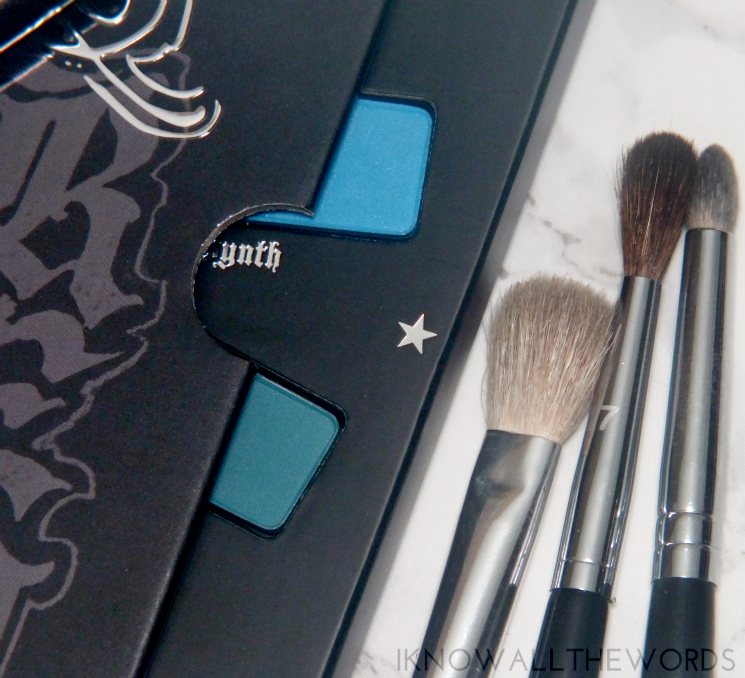 While the matte texture is quite pigmented and smooth, the shadows can kick up a fair bit of powder. Likewise, the satins and shimmers can get a bit crumbly if you go at them too vigorously as they do have a softer texture. The point I'm making is be gentle, and you shouldn't have problems. The neutral family has a few mattes, a satin or two and a bit of shimmer with a really great range of highlight, mid, and deep shades. The neutrals all perform well, even the paler mattes, and have a smooth texture that blends really. All are swatches on lightly moisturized, but otherwise bare skin. Moulder- buttery-cream satin. Great pigmentation for a lighter shade. Vox- deep chocolate brown matte. Strutter- medium-light, warm taupe matte. Black Metal- deep matte black. This is a great black, as it's intensely pigmented, smooth, and very blendable. Skulls- true white with a frosty shimmer. This shade (along with Lyric) works really well as a brow/inner corner highlight when working with matte shadows. Noble- medium, peachy-brown matte. This shade is a little bit less pigmented, but does build easily. Moving into the colours (yay!) I started at the yellow section as it was easiest to break up the shades into groups starting at Legend. 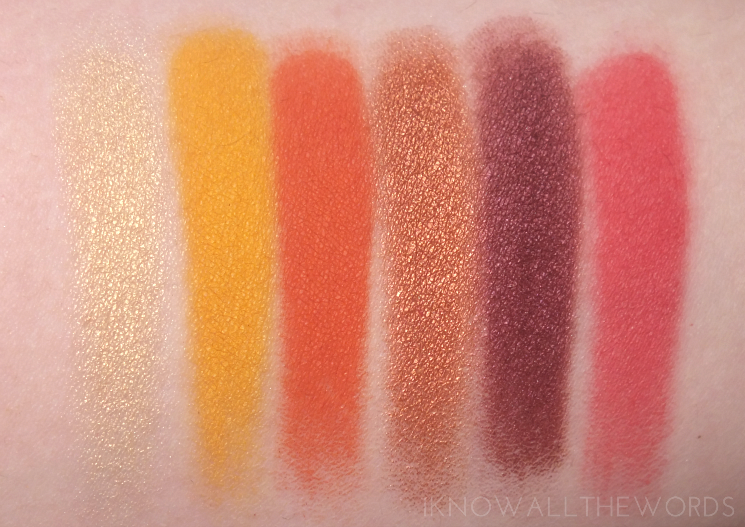 This section is rather warm, and not typical shades for me (I tend to avoid orange) but after swatching these, I am determined to get out of my comfort zone and experiment a bit more. Legend- soft yellow-gold with a metallic sheen. This shade is a bit less pigmented when applied and does need to be build up, but the finish is so pretty, I don't even mind. Analogue- vivid, warm orange matte. Super pigmented and smooth. Harpsichord- coppery perfection with a shimmery, metallic sheen. This shade is all kinds of perfect in colour and texture. Rewind- intense burgundy-plum with brown undertones. One of my favourites. Destroyer- vivid, red-pink matte. This shade is less opaque, a bit firmer in texture and as such needs to be build up. 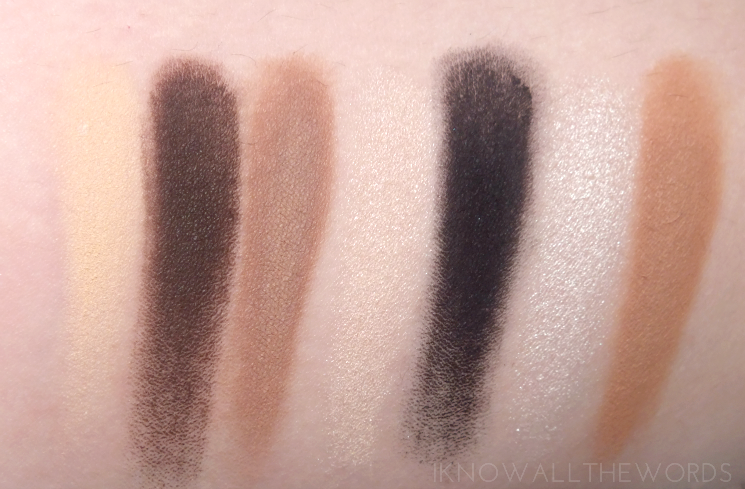 It's workable, but isn't as easily blended as most other shades. Continuing on with the pinks through to purples and the beginning of the blues. Swoon- bright, cool pink matte that just shy of being fuchsia. Love- rosy-pink with just a touch of mauve with a frosted finish.Super buttery and easy to work with. Anthem- medium, purple satin with micro shimmer. This shade is a bit firmer feeling, less opaque, and harder to blend. Muse- cool, pale lavender satin. Echo- medium, violet-indigo matte with silver glitter. This shade isn't so great. It's dry, the glitter is too coarse for the texture of the shadow... It's just not the best shadow overall. Finishing up with blues through to greens. Synth-bright, blue with a slight green tone (cyan-ish?) It has a matte finish with very faint silver micro shimmer.Very pigmented and not for the shy. Hyperballad- blue teal matte. 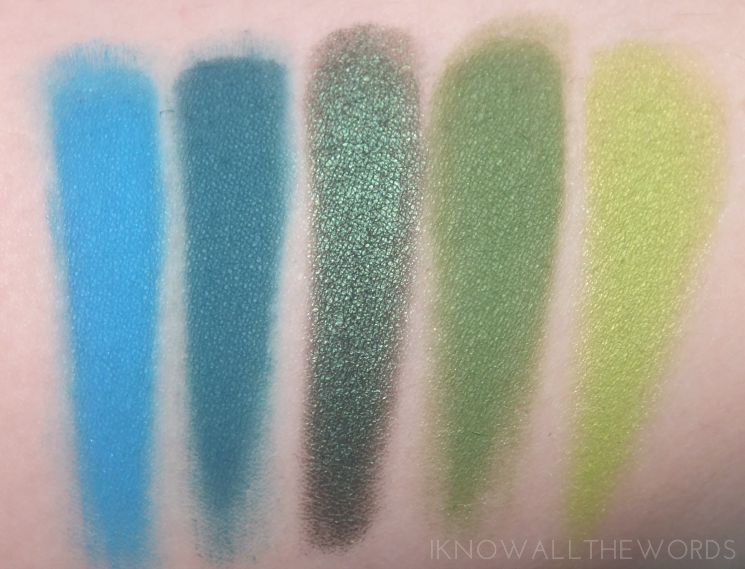 Very smooth and pigmented, but a bit powdery. A really gorgeous shade though. Lemmy- deep green with an olive undertone and a metallic frosted finish. A gorgeous shade with a butter and pigmented formula. Misfit- dirty, grass green satin with light micro shimmer throughout. Vinyl- yellow-based chartreuse green (aka acid green) with light golden-green shimmer. 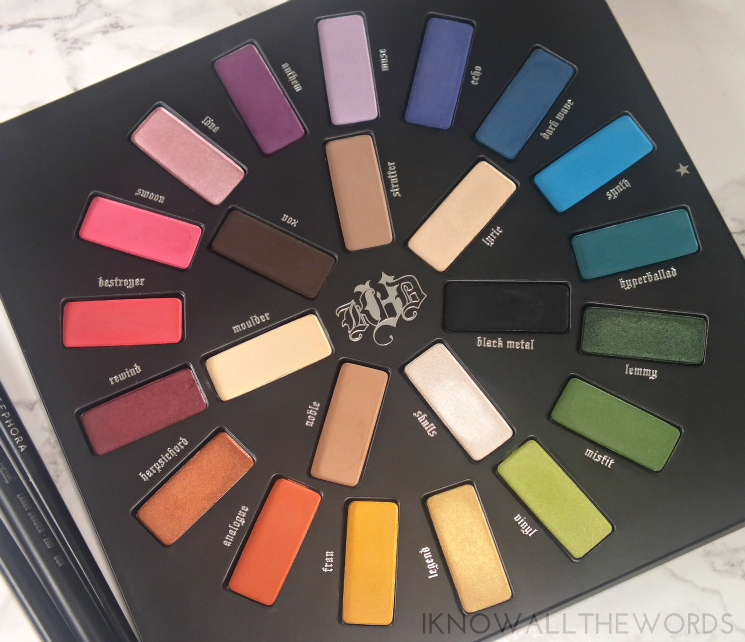 As there are so many shades in this palette that I love, I was kind of lost as to where to start. 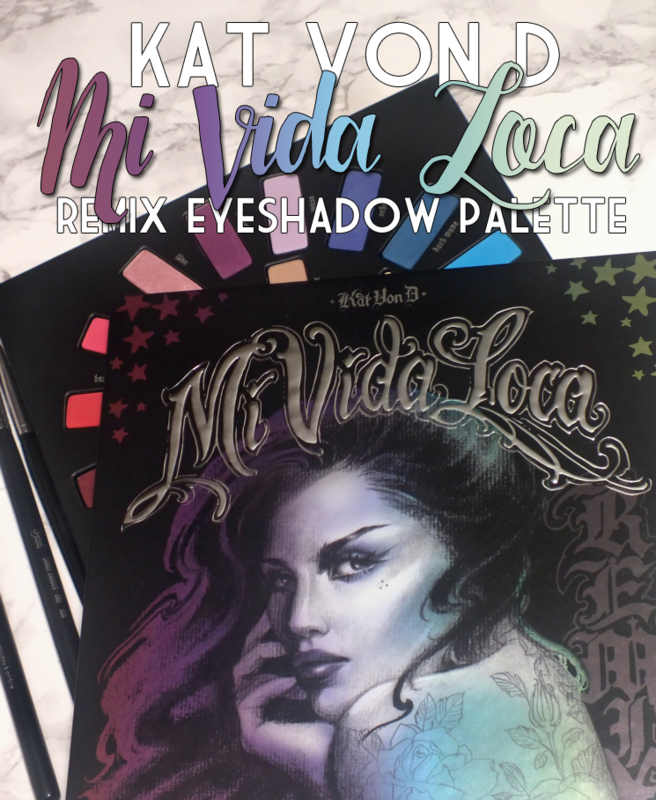 I took advantage of the look sheet that comes with the palette (it includes three looks created by and illustrated by Kat herself.) I went completely out of the norm (for me) and re-created the Misfit look which uses Moulder under the brow, Legend on the inner corner and lid, and Misfit in the crease. I added a bit of Vinyl in the middle of the lid just to blend the gold and green. The lash line is a generous smudge of Rewind. Seeing as nothing is complete without a bit of liner (and it's also shown in the illustration) I added a black wing and tightlined and lined my waterline. The look isn't exactly what I expected based on the illustration, but I kind of love it! 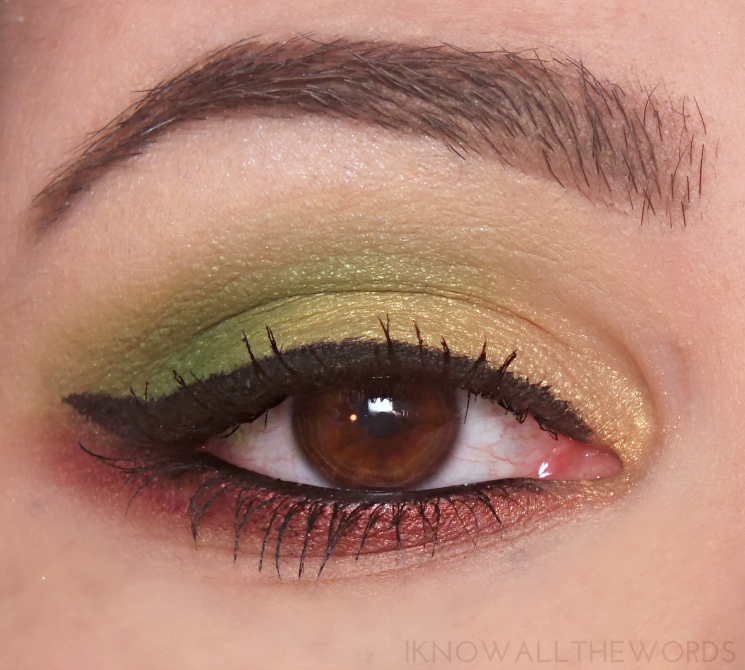 It's not a look I wear everyday, but I'm excited to play around with brighter shade combos. Overall, I'm quite impressed with this palette. Yes, there are some packaging aspects I don't love, and a few shadows that arn't amazing, but overall worth the space in my collection. I love the fact that this is a mix of bold bright colours and neutrals as you really can create any kind of look with just this palette. There are definitely some shades that I wouldn't really gravitate to, but seeing them all makes me think I need to experiment more and get creative. What do you think? Are you a fan of super colourful palettes? What shades do you tend to shy away from?